What a truly gorgeous route! Taking our usual leisurely, photograph taking and multiple lunch break approach we meandered through almost every bit of Kev Reynolds’ route. Each valley seemed to have a quite different character. Glacial or rocky, full of trees or of alpine flowers. Somehow all quite distinct. The few people we met on the route were friendly and the Hut Guardians and Hoteliers all happy to see us. We were very lucky with the weather which can obviously make a lot of difference to how enjoyable a route is. On the third day we were forced down the Alp Bovine route instead of the Fenêtre d’Arpette by rain but since three of the five of us had done it from the other direction and it was so early in the trip we weren’t too disappointed at missing the slog. We also had one afternoon and the following day full of huge thunder storms but were lucky with our route choice and avoided most of it. We knew the weather was about to change and so made a brisk morning of getting to the Hotel Weisshorn to watch a procession of storms moving up the Rhone Valley. With the occasional storm cell hopping over the mountains across the valley from us to batter the hotel and crackle off the peaks less than a kilometre behind us (we counted the “flash-bang gap”, 3 seconds per kilometre). The next morning we watched and waited for a gap which allowed us to get over the Meidpass and into the next valley. The lightning was hitting the peaks behind us ten minutes after we got off the col. So overall, lots of sun and truly stunning views. LB’s arm worked out fine with her perfecting her cat-like walking style to pick her way over even the slipperiest rock slide on the Europaweg. Our regular walking buddy Rachel was with us and since she’s a physiotherapist we decided to go with the Swedish doctor’s advice and take the cast off after four weeks, halfway through the walk. The wrist is now mobilising nicely with the exercises that Rachel gave her. The gear almost all worked out really, really well with only one thing letting me down and needing repair. A couple of postings on gear to come. The Kev Reynolds guide book was very helpful in taking us through the nicest parts of the route and avoiding dull spots like roads and ski pistes. Letting us make the whole trip without resorting to cable cars, buses or any form of transport other than our own two feet for the entire journey of fourteen and a half days. It was one long, glorious walk. 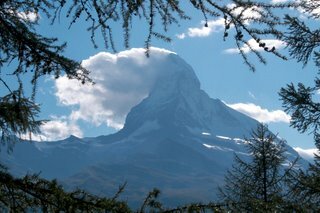 180 kilometres from Chamonix to Zermatt with about an Everest and a half of height gain (12,000 metres). If LB hadn’t got a final Master’s exam and dissertation to get back for, we really would have turned around and done it in reverse! Good to hear that everything worked out nicely and that you enjoyed your trip! Looking forward to your postings. Am feeling very jealous – great stuff! Thanks for your comments guys – always nice to know it’s not just spam-bots hitting the Blog! Loz – The next big walk is looking likely to be Iceland. The Landmannalaugar to the ÃžÃ³rsmÃ¶rk (roughly pronounced as: “Land-man-a-loger to Thors-merk” – LB thinks!). Not very long, camping for some of it. I’m hoping you’ll be along for that one! Not sure if noticed this but you’ve almost certainly those two red dots on the left of South America on the ClustrMap on the right (and I think I can pick out Laura and Sverre in Norway too).